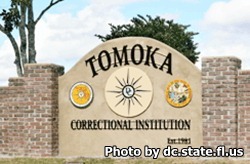 Tomoka Correctional Institution is located in Daytona Beach Florida, part of Volusia county. It is a level V facility that can house up to 1,263 adult male inmates of medium, minimum and closed custody levels. Vocational opportunities at this institution include masonry and carpentry. Inmates can also earn an adult basic education and a GED through the academic programs offered. Although this facility offers no formal substance abuse treatment the chaplaincy services and institutional betterment programs offer similar treatment through AA/NA meetings and celebrations of recovery from substance dependence. The chaplain's office also offers religious studies and worship. Visiting is on Saturdays and Sundays from 9am-3pm for approved visitors only. To become an approved visitor you must first fill out a visiting application. Everyone who arrives to visit an inmate must register. Registration begins at 8:15am and ends at 2pm. If you arrive after 2pm you will not be allow to enter into visitation.